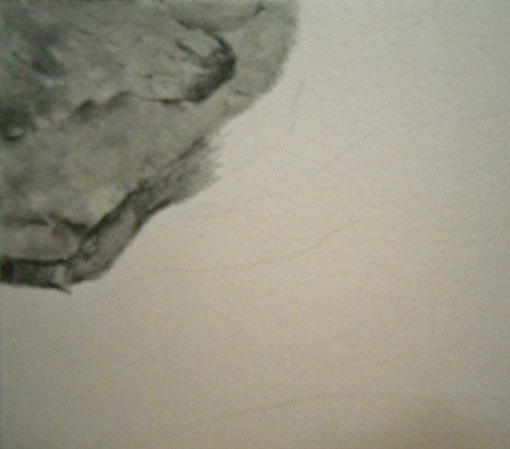 Progress, perhaps at a snail’s pace, but none-the-less was made on the Water Veil drawing. The work completed today was on the upper-left corner. 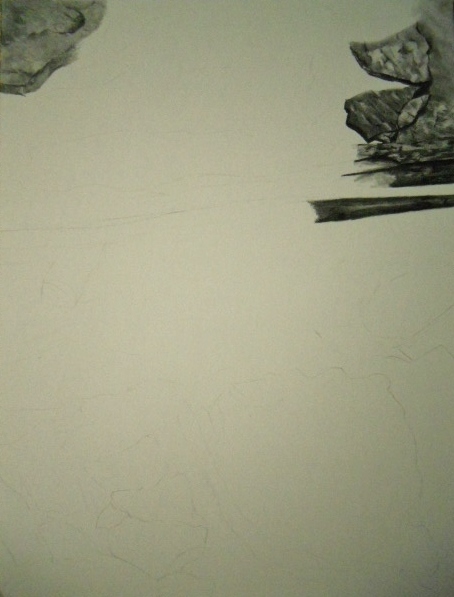 In the final drawing this corner will be behind the water’s veil, so the values of the rocks, crevices and veins were analyzed against the darkest rocks to be sure that they would read correctly after they were drawn in. In addition in the end these rocks need to be a bit blurry and out of focus to the viewer, because of the veil of water. I’ve included a close-up of the area worked on today, as well as a full image of the entire surface for the drawing so you’d get a better perspective where this area is in relationship to the entire drawing. Thanks Calee – so glad, because it can get a little tiresome for folks to want to follow along slow progress. Appreciate your comment so much! Thanks for taking us through the process it helps us to see how much of you is going into each work of ART! Thanks so much – I get lost in my focus while drawing this scene. Thank you!! Thank you Elena for sticking with this project! It is incredible how little by little you are building up the drawing. Looks good! Hi Patricia, thanks – means a lot. This piece is definitely going to be a challenge as I get further into the drawing, and not so much the drawing itself but the creating the water veil w/o disturbing the drawing underneath. Going up to the studio to work on my next painting – will be catching up on the reader posts this evening and tomorrow, can’t wait to see what you painted today. Thanks, appreciate your support! !